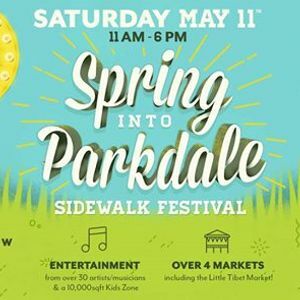 The 7th annual Parkdale Festival kicks off Saturday May 11th, 2019 along Queen Street West from Roncesvalles Ave to Dufferin St. Celebrate Parkdale Villages 140th Anniversary Year at our 1.4km Sidewalk Sale - 150+ vendors - free entertainment - 10,000sqft Night Market showcasing local Chefs - 10,000sqft Kids Zone brought to you by The Boulevard Club - Community Zone - Zero Waste Fair hosted by Zero Waste Hub Toronto and a Little Tibet Zone brought to you by Students for a Free Tibet Canada plus so much more! The Sidewalk Festival takes place from 11:00am-6:00pm, and the Night Market attraction at the Festival takes place from 4:00pm-9:00pm. Thank you to everyone in advance for your help in reducing waste at this event, please B.Y.O. (Bring Your Own) containers, cups, cutlery, napkin, & straw if possible, and otherwise “recycle right’ & avoid littering to help show some love for Parkdale and planet Earth & reduce necessary clean up efforts post-event. 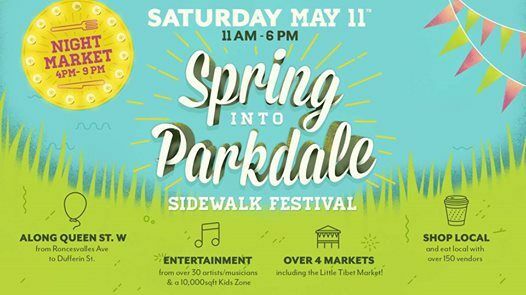 The Spring into Parkdale Sidewalk Festival & Night Market is brought to you by the Parkdale Village BIA, The Boulevard Club, Toronto Parking Authority, and is in partnership with Students for a Free Tibet Canada, Zero Waste Hub Toronto and TABIA. Thank you for your support and commitment to Parkdale Village!